This website is supported by sales of iCare products. By purchasing them, you help us to pay for the costs of Internet hosting/bandwidth/maintenance and provide this online training. Thank you for your support! 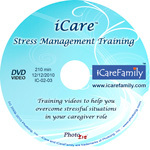 iCare DVD/workbooks contain all unabridged iCare training, with all topics, description of concepts, examples, additional information, forms, exercises, and instructions.